Keep the Holly Prize Alive! Proceeds from this Limited Edition, Limited Time Offer support Songmasters’ Holly Prize awarded annually through the Songwriters Hall of Fame to a young, exceptional singer/songwriter and performer in the Holly tradition. Enter to WIN! Each time you purchase this DVD you are automatically entered to win a limited edition copy of the "Ultimate Buddy Party” concert poster signed by concert legends Stevie Nicks, Graham Nash, Paul Anka, Peter Asher, and more artists including Gabe Saporta of Cobra Starship, Shawn Colvin, Chris Isaak, Lyle Lovett, Raul Malo of The Mavericks, Boz Scaggs, Patrick Stump of Fall Out Boy, and Michelle Branch, plus many of the top musicians who made the music possible: Lee Sklar, Doug Livingston, Jeff Ross, Bill Cinque and Rowland Salley. No purchase necessary. Click Here to enter the contest without purchasing the DVD. This limited edition DVD of the live concert and PBS broadcast contains performances by music legends Stevie Nicks, Graham Nash, Chris Isaak, Patrick Stump, Cobra Starship and more including, Phil Everly’s last onstage appearance. BONUS ROUND: The "Ultimate Buddy Party” includes BONUS TRACKS never seen before and over 20 minutes of behind-the-scenes bonus material. 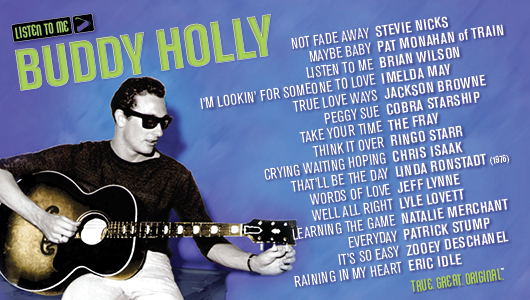 Preview the Buddy Holly: Listen To Me Concert, Award-Winning PBS Special!